We describe the outcome in a series of patients treated for metastatic peri-actetabular and iliac bone destruction using a modified technique of Harrington’s procedure. Between 2006 and 2012, nine patients with a mean age of 62.2 years (42–75 years) were treated using a modified Harrington technique. Thereby, total hip replacement implants augmented by two to three threaded pins and cement were used to restore bony continuity of the pelvis and to achieve a stable construction allowing immediate full-weight bearing mobilisation. Acetabular destruction was graded according to Harrington’s classification of peri-acetabular metastatic destruction, as class IV in one case, class III in six, and class II in two cases. The pre-operative ASA score ranged from II–IV. There were no intra-operative deaths or major complications such as excessive haemorrhage, deep infections, lesions of the femoral nerve, loss of fixation, or dislocations at final follow-up. Eight patients achieved an improvement of their functional status postoperatively. One reconstruction required revision and four patients died due to their underlying disease ten to 36 months after surgery. 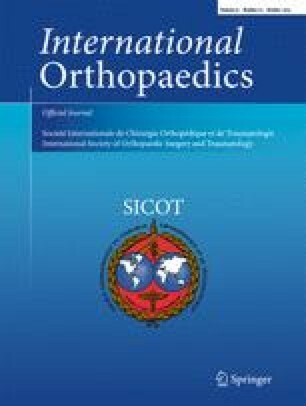 We found this technique an effective, reproducible, and long-lasting method to relieve pain and improve or restore function in patients with destructive metastatic lesions of the peri-acetabular bone and the iliac wing. Although we performed surgery even in severely ill patients with extended, generalised metastatic disease we had no intra- or postoperative death and observed no major complications.